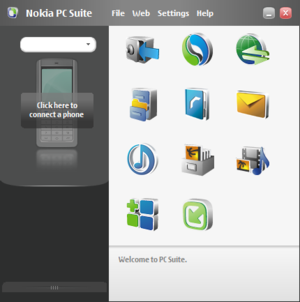 Nokia PC Suite is free Nokia PC software & Windows-based PC applications developed especially for use with Nokia phones. Depending on your Nokia phone model, Nokia PC Suite lets you edit, synchronize and back up your Nokia phone's files on a compatible PC through a cable or wireless connection. The Nokia PC Suite connections, features, and add-on applications available to you after installation depend on your Nokia phone's built-in software. ...... This Nokia PC Suite software will enable you to connect your Nokia mobile phone to any desktop PC to sync data, back up, download and install Nokia PC Suite software, update software, share pictures and music between the Nokia mobile phone and PC. Qweas is providing links to Nokia PC Suite 7.1.180 2012 as a courtesy, and makes no representations regarding Nokia PC Suite or any other applications or any information related thereto. Any questions, complaints or claims regarding this application Nokia PC Suite 7.1.180 2012 must be directed to the appropriate software vendor. You may click the publisher link of Nokia PC Suite on the top of this page to get more details about the vendor.